« Farmers’ Market Season Begins! Garlic is one of our favourite crops, making the harvest an exciting time for us. This year’s crop is the first garlic we have grown here at Fiddle Foot Farm and it is looking great! Once we decide that the garlic is ready to be pulled, it is all hands on deck to gather bundles and hang them up in the upper barn to dry and cure. The curing process takes three weeks and improves the storability of the garlic. Only after it is cured, when we sort through it all, will we truly know how the year has been. But, coming in from the field, we have a good feeling about most of this year’s crop. We saved all of our own seed garlic (14 varieties) and planted it last fall. The only additions in the seed stock were some special varieties (17 more varieties) we found at the Garlic Festival in Toronto last fall and decided to plant out to see how they did in our fields. 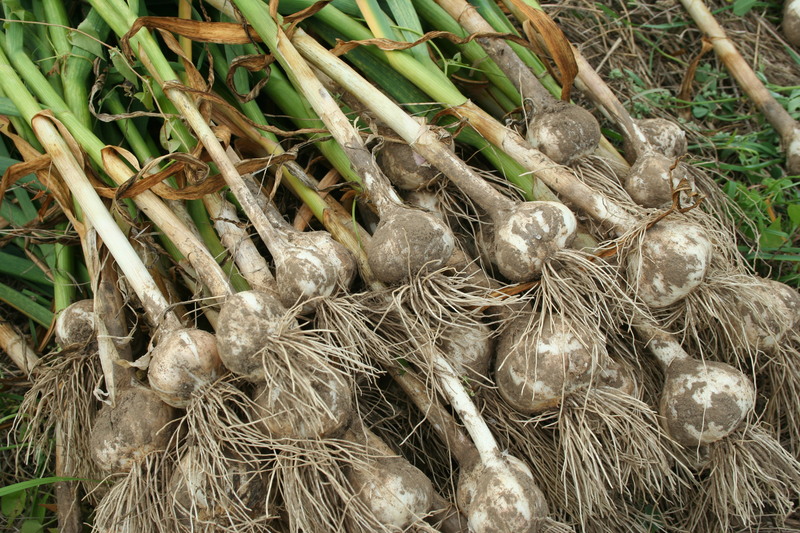 Most of the garlic we grew is a Music variety of Porcelain garlic which is very well suited to this region. It divides into four large cloves making it very easy to work with in the kitchen. The disadvantage to this characteristic is for us as seed savers – while you get large cloves to plant which produce vigorous plants, you can only save four seed cloves from each head as opposed to the Rocambole varieties which each have approximately 7-10 cloves per head. For this reason, and because of our appreciation for diversity, we continue to plant many different varieties of garlic. We will be selling our garlic at both the Creemore and Orangeville Farmer’s markets for the remainder of the season. If you are a garlic lover and would be interested in placing an order for a specific variety, please let us know – fiddlefootfarm@gmail.com. Our price for garlic by the pound is $8 – remember that it is worth paying more for garlic that has more flavour since you’ll need to use less! Consider sharing locally and organically grown garlic with your friends and family. We are happy to provide an alternative to buying dried out garlic from halfway around the world that you find in the grocery store.